What are your follow up statistics? It is a classic story. We’ve all heard a version of it. Here’s my story. We recently remodeled the kitchen and bathrooms in our 1954 mid-century modern. It was an expensive floor-to-ceiling overhaul. We called 7 cabinet makers that we trusted do the work, including a friend who had done great work for us before. Only 5 called us back to set appointments. Only 4 actually showed up for the appointments. Those 4 contractors, including our contractor friend, spent loads of time measuring, sketching and asking us questions about everything. They also provided detailed 3D plans with their bids. Only 2 called us after sending the drawings and bids to see if we had questions and if we were ready to get started. One bid was way over our clearly communicated budget and the other came in a little under budget. Guess who won the work? You’re right, the one that listened to our needs and followed up. And sadly to say, it wasn’t our friend. He never called. What? Why would you do hours of work and not spend 2 more minutes and follow up? Did you know that 44% of salespeople give up after one follow-up? And, the average sales person only makes 2 attempts to reach a prospect. Here is the kicker, 80% of sales require 5 follow-up phone calls after the meeting. (source Hubspot) That means nearly half of all salespeople have an 80% chance of not making the sale. It’s no wonder so many salespeople get so discouraged. How many contracts have you lost because you didn’t follow up? 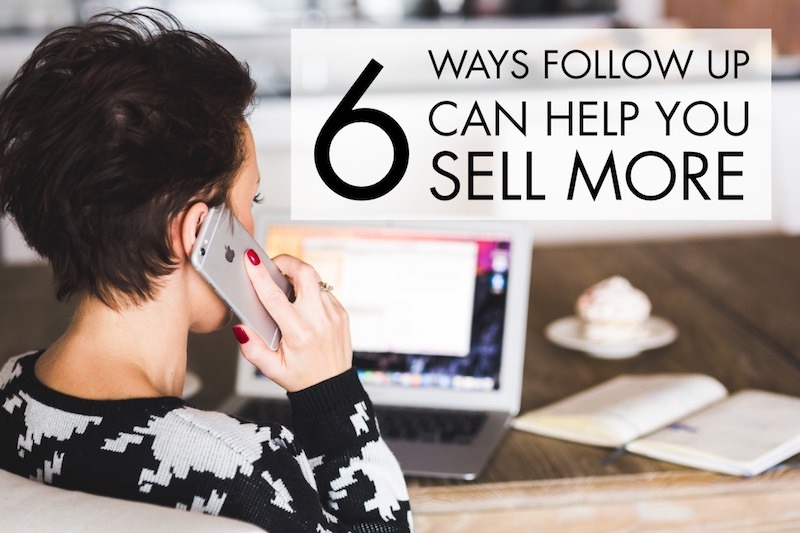 Here are 6 tips to help you become a follow up fanatic and not a follow up failure. Use a CRM to track and schedule your commitments. Set automatic reminders for yourself and don’t stop working until you follow through with your commitments. If you don’t have a CRM, it is time to get one. CRMs range in price from free to very expensive and have endless variations of capabilities depending on your needs. Do a little research, ask around, take advantage of free trials and decide what you want the application to do before you sign any long term contracts. If you are really too busy to follow up with customers who really want to work with you and want to give you commissions, maybe it is time to get some help. There are many options from a traditional assistant, to virtual assistants, and various service providers. You can outsource everything from call answering to appointment setting. VA’s can add a personal touch to so many aspects of the follow up process at a fraction of the cost while freeing you up to work more listings. I am sure you already know this, but you are not the only agent in town. The longer you delay follow up the more likely your lead is going to find another option. According to InsideSales.com, 35-50% of sales go to the person that responds first. Here is another interesting stat, if you follow up with online leads within 5 minutes, you’re 9 times more likely to convert them. Whoa! Many of us have some work to do there, including me. The more consistent you are at doing what you commit to do with your prospects, the more trust you build with them. Follow up isn’t an event, it's usually a process with multiple steps. 63% of people requesting information from you today will not purchase for at least three months – and 20% will take more than 12 months to buy. (Source Hubspot) Your consistent actions will become habits. These good business habits will result in more transactions. Think about ways you can be helpful before you follow up. Ask thoughtful questions and be a good listener. Remember, better questions get better answers. The goal is to build the relationship. Everyone is busy, including your prospects. I don’t think they are waiting around for you to just check in with them to chit chat. I do think they would welcome genuine help in the process of buying/selling their biggest asset. Not every prospect is a good fit. I was grateful for a plumber who told me he would love to do the work but he was booked 4 months out. I'm so glad he didn’t try to fit me in and drag me along for months. He was straight with me. We should be the same with our prospects. If you don’t want the contract or can’t meet the needs, let the prospect know and refer them to a few trusted associates. I have never regretted sharing work with a friend and it always seems to come back around in the best ways. These are just a few ways to improve your follow up. You can Google tips for sales follow up and you will see many more ideas. The key is to apply some of the ideas and improve our follow up skills. The costs to follow up are inexpensive compared to the huge financial losses if you don’t. Oh, and I finally talked to my cabinet-maker friend a few months after my project was complete. I asked him why he never called us. He said he didn’t want to be pushy and thought maybe we didn’t like his design and that we found someone else. How would he every know if he didn’t call? He was our first choice but lost the job because he never followed up to ask for the work. I hope he never makes that mistake again. Feel free to share what you do to be the master of follow up.